Recombinant Human and Rat HO-1 (Hsp32) Protein. IHC-P: FFPE mouse spleen normal and rat spleen normal. Our Abpromise guarantee covers the use of ab13243 in the following tested applications. WB 1/2000. Detects a band of approximately 32 kDa (predicted molecular weight: 34.6 kDa). Sandwich ELISA Use a concentration of 0.5 µg/ml. Can be paired for Sandwich ELISA with Mouse monoclonal [HO-1-1] to Heme Oxygenase 1 (ab13248). For sandwich ELISA, use this antibody as Detection at 0.5 µg/ml with Mouse monoclonal [HO-1-1] to Heme Oxygenase 1 (ab13248) as Capture. IHC-P Use a concentration of 1 - 5 µg/ml. 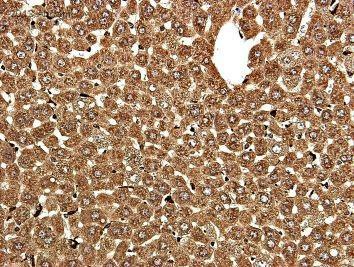 Perform heat mediated antigen retrieval with citrate buffer pH 6 before commencing with IHC staining protocol. Heme oxygenase cleaves the heme ring at the alpha methene bridge to form biliverdin. Biliverdin is subsequently converted to bilirubin by biliverdin reductase. Under physiological conditions, the activity of heme oxygenase is highest in the spleen, where senescent erythrocytes are sequestrated and destroyed. Belongs to the heme oxygenase family. Hek293 & HL60 presumed negative or very low expression. IHC image of Heme Oxygenase 1 staining in formalin fixed, paraffin embedded rat spleen normal tissue section*, performed on a Leica Bond™ system using the standard protocol F. The section was pre-treated using heat mediated antigen retrieval with sodium citrate buffer (pH6, epitope retrieval solution 1) for 20 mins. The section was then incubated with ab13243, 5µg/ml, for 15 mins at room temperature and detected using an HRP conjugated compact polymer system. DAB was used as the chromogen. The section was then counterstained with haematoxylin and mounted with DPX. Alzheimer diseased section stained with ab13243. 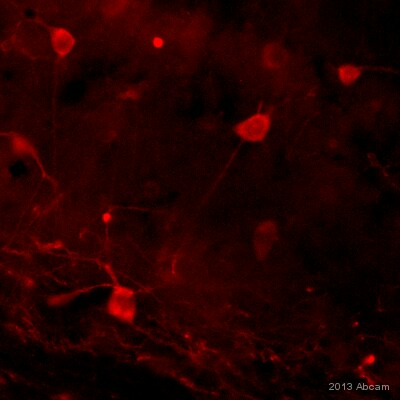 ICC/IF image of ab13243 stained HepG2 cells. The cells were 4% PFA fixed (10 min) and then incubated in 1%BSA / 10% normal goat serum / 0.3M glycine in 0.1% PBS-Tween for 1h to permeabilise the cells and block non-specific protein-protein interactions. The cells were then incubated with the antibody (ab13243, 1µg/ml) overnight at +4°C. The secondary antibody (green) was Alexa Fluor® 488 goat anti-rabbit IgG (H+L) used at a 1/1000 dilution for 1h. Alexa Fluor® 594 WGA was used to label plasma membranes (red) at a 1/200 dilution for 1h. DAPI was used to stain the cell nuclei (blue) at a concentration of 1.43µM. Standard Curve for Heme Oxygenase 1 (Analyte: Heme Oxygenase 1 protein (Tagged) (ab85243)); dilution range 1pg/ml to 1µg/ml using Capture Antibody Mouse monoclonal [HO-1-1] to Heme Oxygenase 1 (ab13248) at 5µg/ml and Detector Antibody Rabbit polyclonal to Heme Oxygenase 1 (ab13243) at 0.5µg/ml. Publishing research using ab13243? Please let us know so that we can cite the reference in this datasheet.